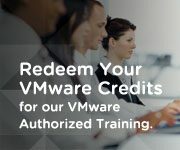 Earning the new VCDX–Cloud certification from VMware will validate your world-class vSphere and Cloud Infrastructure design skills, and will make you one of the first globally-recognized enterprise-class Cloud Architects in the industry. If you are VCDX5-DCV or VCDX-Desktop certified, earn the VCAP-CIA and VCAP-CID certifications. In the next step submit a successful VCDX-Cloud application and design then you get your VCDX-Cloud certifications.